He established the first coal briquette-manufacturing plant in Korea. enterpriser to run an energy business for his lifetime. provided coal briquettes, coals, petroleum, and LPG for local communities. His operation philosophy was based on the honesty and constant efforts. He always focused on the following attitude and mind " We got to run a firm with self-restraint and considerate thoughts. Find out what business is good for our firm and operate it step by step." The name of the company, 'Daesung' was named by abbreviating 'Daegimansung'. After the 1st and 2nd oil shocks in separately 1973 and 1978, he was interested in alternative energy resources and founded Taegu City Gas Corporation in 1983 and, then, improved Daesung Group into a complex energy firm after acquiring Seoul City Gas Co. The founder, Kim Soo-keon, was born in Taegu on the 25th of September, 1916 as the first son among 3 brothers and a sister. His father was Kim Doo-yun, and mother was Ki Myi-im. He went to Taegu elementary school in 1923. Upon graduating from Taegu Commerce high school in 1934, he enrolled a university in Japan. In 1943 he received degree in Law and passed a test for a finance union with the top score. He was selected Director in Kyoungbook Shinyoung Finance Union in 1944 and Director in Youngchun Finance Union in 1945 trying to reduce the usurious loan of farms and raise farmers. In May 10th 1947, he founded Daesung Industrial Corporation, Korea's fist a briquette manufactory with pure national capital and promoted the mass production of briquette, opened the way of supplying the briquette and forest conservancy and tree-planting campaigns. In 1952, he took up the Chief director in Kyoungbook Coal Union and affected on the supply of coal in Kyoungbook area. And he also took up the director in the Korea Heat Energy Management Association and in 1959, he acquired the Wangshimli Briquette plant founding Daesung Briquette Co. as the stepping stone for entry into Seoul. In 1960, he began in earnest Coal Mine Development as he acquired Mungyeong Coal Mine Company and in 1964, he started LPG Gas sales by the agreement with Korea National Oil Corporation. In 1965, he established Daesung Coal Mining Area Development Company. In April 1967, he received the achievement award for increasing amount of hard coals from Prime Minister and in 1968, he extended the business to the sales of oil by establishing Daesung Industrial Co., Ltd so that he made the firm basis of Korea's first total energy corporation which supplied briquette, coal, oil and LPG gas to the home and industries. In June 1976, he established Daesung Mining Development Co and developed the underground resources in earnest. And in July, he founded Changwon Carburetor Industrial Co and entered into the auto parts business. In 1977, he received a prize for industrial packaging and in February 1979, he founded Daesung Sanso Co, which produced industrial gas. In March 1983, he received the second ranked prize in industrial achievement from government in Korea and in August 1985, he founded Cambridge Filter Korea Co. In September, he founded Daesung Celtic Co for the purpose of safe heating and prevention of pollution and produced gas boilers. In June1987, he founded Daesung Automotive Co, and in December, he founded Daesung Measuring Co. In May 1988, he founded Daesung Nachi Hydraulic Co and in June, he received Ordre National Du Merite from the Government of France for the meritorious service between Korea and France. In June 1989, he established Daesung Henkel Chemical Co., Ltd. producing industrial detergent protecting the environment. In the late 1980, he positively took part in the overseas resources development for stable supply of domestic energy resources, In the field of Coal, he joint ventured to Australia Draton Coal Mine or so and he got stable supplying network for generating or manufacturing coal through the cooperation with China, Canada, South Africa and Indonesia. In addition to this, he also positively invested to the development of overseas Oil Farm and Gas Farm in Libya, Vietnam, and the U.S.A so that he activated the development of Overseas Oil Farms to rank the energy businesses in Korea. In May 1995, he was listed to the honored doctor in Business at Yonsei University and in July 1996, he founded Taegu TRS Co for the bridgehead of Information Tele-communication business. In July 1997, he founded Cable Television Gyeonggi Center Co.,Ltd and in July 1997, he established Gyeongbook City Gas Co. In December 1998, he established Seoul Energy Co., running a Heat-absorption Plant to make it sure as the status of a energy focused company and finally, in March 1999, he received the first ranked prize in industrial achievement from government in Korea. 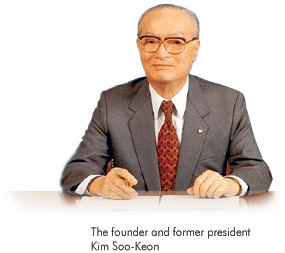 Founder Kim Soo-keon, Honorary President, accelerated all potential abilities to challenge for national industrial development with a rest as the founder of Daesung Corp. with 16 excellent subsidiary companies such as the mother company Daesung Industrial Co., Seoul City Gas Co., Taegu City Gas Co., Daesung Sanso Co and so on from May 1947 to October 2000. He deceased at the age of 85 with the last statement " Though life is mortal, corporation should be immortal." on February 20th, 2001.